Sometimes a product comes along, a product that makes you feel like it was deliberately created specifically just for you. A product that fits everything you do, a product that you know you can count on to be there when you need it. For many years a portable wireless sonar was out of the question for me, one of those things I could only wish for because it did not exist. I always knew that at some point, with the development of the smart phone an app and product would be coming to give anglers like me that portable sonar I had been waiting for. No longer would I be handcuffed by wires and bulky baggage, I could just simply walk by and smile at the sonar salesman trying to sell me the wired, big screen, fisher price looking expensive units. So, I bid my time and waited, I’m glad I did! It’s November 2015, it’s cold out and I’m on my phone looking at fishing apps when I come across the Deeper Wireless Sonar. Right away I’m intrigued, I started looking a lot closer at what the Deeper could do. I’m sitting there with a big smile on my face knowing finally we might have the answer to the portable sonar. I jumped in the truck, drove an hour and a half to Edmonton and purchased the Deeper Wireless Sonar and started using it within my fishing system. I found the product to be everything it won multiple awards for, as advertised, and so very much more. In February 2017, I wrote the Wireless Fishing Tech blog post about it. Since then I’ve been invited and honoured to Join Deeper as one of their community of anglers within the Deeper Hero Program. In my last article, I spoke about the Deeper 3.0 – it connects via Bluetooth and has been an outstanding unit I love very much, I got attached to that unit. But the fine folks at Deeper UAB went above and beyond and created the Deeper Pro + It is a unit that connects via Wi-Fi, yes you read that right, it supplies its own Wi-Fi connection. Anywhere, Anytime, you have a connection no matter your location, and believe me I can get to some wild and remote locations. You’re not going to get over what this thing can do! I’m going to lay out a case for you, let’s look a bit closer at the Deeper Pro +. For shore anglers cast Deeper Pro + out into the lake and reel in the info you need. Deeper products work on both iPhone and Android smartphones and tablets. Deeper Pro + is crafted with high quality components and is incredibly durable. It’s easy to charge up, comes supplied with a USB charging cable, it seals up easily to keep waterproof. In addition, it is very quick to connect to your tablet or smart phone. Deeper gives me complete confidence, I know what I see on the screen is accurate, I know it’s right, I know it’s true. Confidence and trust in a piece of equipment is paramount, Deeper has always given me that confidence and trust, when I use it I know the information is right. I’m going to give you 5 reasons to get a Deeper Pro + into your must have fishing equipment. Deeper Pro + with Deeper Flex Arm out in front of my boat detailing everything for me. #1. Wi-Fi: The Deeper Pro + comes out of the box with built-in Wi-Fi, which gives the unit a powerful connection which can withstand tough conditions on the lake. The Wi-Fi also provides much more power to upload sonar data to your smart phone or tablet with incredible detail, you can adjust the sensitivity based on the water quality you are fishing allowing you to really dial in your sonar to the body of water you are fishing. The Wi-Fi also gives you a portable sonar that you can take to a body of water anywhere on the planet, it will provide its own Wi-Fi to connect, it will connect fast. Deeper will deliver quality information to keep you on top of the fish anywhere. Detailed weather info to help keep you on the mood of the fish you are after. #2. A massive 330ft/100m casting range. The built-in Wi-Fi gives the Deeper Pro + a far superior casting range, for anglers fishing from shore this is vital. You can get the Deeper into the area you need to see and map with ease. Because you can cover more area with each cast of the deeper you can cut down the time searching your area. The extra distance means less casting of the sonar and more casting of your lures and bait to the fish. That in return means more fish get marked with the sonar and more fish get caught. Smart, simple, effective time management that no other sonar of any kind on the market can offer, only Deeper Pro + gets this job done for shore anglers. Make notes for specific dates, winter or summer mark locations and keep on top of the fish. #3. An incredible 260ft/80m depth range. Again, the Wi-Fi giving the power to really expand the reach of this Dual Beam wireless sonar. For Ice fishing an amazing 15° @290kHz cone which is nice on the ice as the Deeper Pro + can zero in and bring what is under the ice right to your smart phone or tablet. With incredible detail and extremely accurate information Deeper Pro + is an absolute game changer for Ice Fishermen. For open water a 55° @90kHz wide beam which provides a tremendous search area for a portable sonar. With the ability to adjust the sensitivity of the unit you can dial in any body of water quickly and accurately. With the various modes of view, you can set the screen color mode to fit the time you are fishing, with a Day light option which helps you to easily see your information in bright light conditions, a Deeper Classic mode which provides amazing detail on a carbon background very colorful highly detailed view. There is also an option for those who like to fish at night, with night view to help reduce the impact of light from your screen on your eyes so you are not blinded as you look away from the screen. These are the kind of high quality features found on expensive top of the line wired sonars found on boats. Deeper also has a Night fishing cover for the Sonar so you will be able to see it in the darkness out on the water. Handy, smart, thoughtful, Deeper Pro + is equipped to give you the edge no matter the time. Mapping and Marking of fish, here in my history, with Deeper operating in daylight mode you can see my shoot n scoot run and this Walleye I caught below. One of a bunch of fish from this particular day, see this fish below. #4. Built-In GPS: Deeper Pro + comes out of the box with an incredibly accurate GPS receiver, this thing will allow you to create Bathymetric maps on the go! Yes, you can create your own maps, get this, from shore or from a boat. Now, that high mountain lake I was not able to get to with my boat, yeah, the one I must hike up to! Now with Deeper Pro + Onshore GPS Mode, I can map that lake! I love this, you will too, hey, no ridiculous chip required! Once I log on to my account, and Deeper Pro + starts mapping, it will allow me to later log in to Deeper Lake book and it will load my maps on my PC to review, without need of a chip, I can download my GPS and Depth data for reference later. Deeper Pro + offers so much more to anglers in the way of portability that it is a must have for all anglers. Deeper Lake Book – View from my PC Map in Satellite mode. #5. Lake Book-Deeper Data Manager: This cool feature is new; all your maps are automatically transferred from your mobile app to Lake book. All you need to do is simply log in and review your personalized Deeper data, printable and downloadable information, transferred without having to worry about chips. Ease of use, quality, dependability, portability, use Deeper Pro + at night, on ice, in a boat, from shore, from a canoe/kayak from a bridge, Deeper comes ready to help you catch fish, and help you with maps and Lake Book to dial in future fishing adventures. The smallest most powerful portable sonar ever created. Deeper Pro + marking fish results in nice Walleye, this fish marked in the photo above. I will be out doing hands on instruction with the Deeper Pro + this summer to help anglers learn the features and show how easy a Deeper is to use. All ages, all skill levels, all anglers, Deeper Pro + is for everyone. If you would like more information please don’t hesitate to contact me and discuss the Deeper Pro + and how it can help you. Deeper Pro + packs all the features you will need to have a successful day fishing, with so very much more. 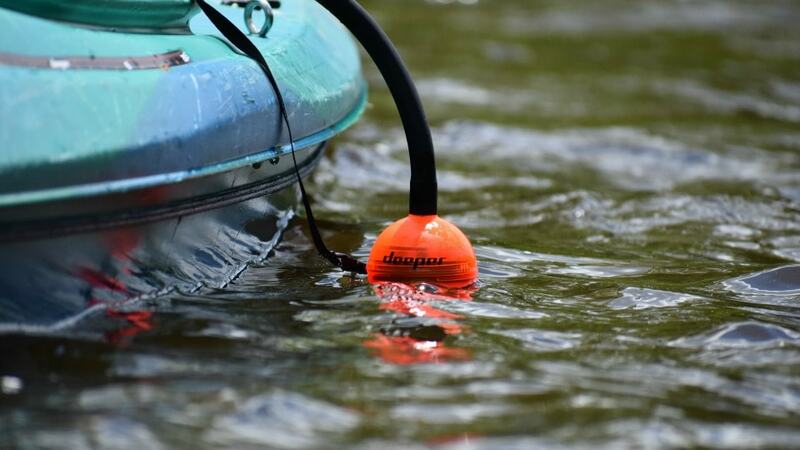 Its small size makes for an effortless easy to deploy solution to solving the age-old question asked by anglers for generations who walk up to a lake and ask. I wonder how deep it is out there, and where are the fish at? It’s 2017, simply break out your Deeper Pro +, and hey! Keep those fish busy eh!